A well-stocked pantry is, in its own right, an essential kitchen tool. With just a few strategically-picked items on hand, you can create dishes on the fly and develop deep flavors in a short amount of time. 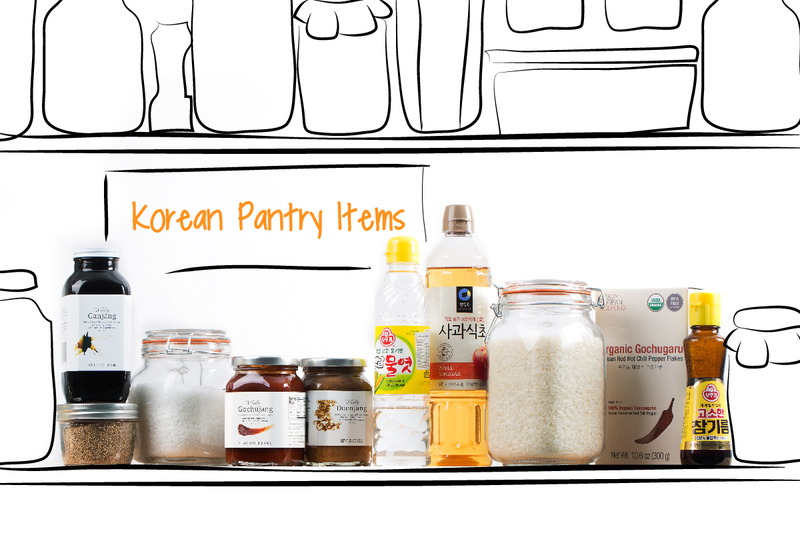 We've compiled ten of the most essential pantry ingredients for Korean cooking, ones that would work for a seasoned chef or a novice cook. Each is versatile, and each has a long shelf life. Like your favorite uncle, sesame oil is rich and nutty, and even in small doses, it makes its presence known. 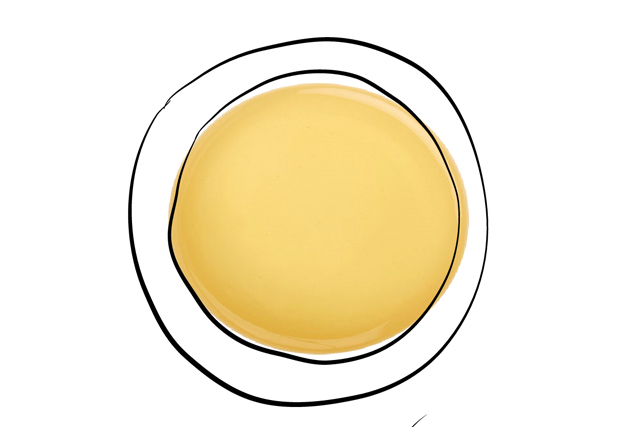 As the steady heartbeat of Korean cuisine, sesame oil is used to enhance flavor and aroma of namul [nah-mool] (vegetable side dishes), bibimbap, and dipping sauces. If you're familiar with Korean BBQ (and if you're not yet, what's going on? ), you may have seen it served alongside Samgyupsal (Korean Pork Belly BBQ) as a dipping sauce. It can also be used to treat minor burns, but let's be optimistic. Sesame oil is the foundation of the house, the percussion section of the band—it's the roots of a tree that extend far beyond the crown. It's also an oil. Calling sesame seeds a garnish is like calling your guest a party decoration. Sesame seeds are not wilted parsley leaves dangling off broiled tilapia, nor are they paper thin limes plopped onto margarita glasses. Technically, yes, they are a garnish, but in Korean cooking, sesame seeds are used to impart a roasted and more complex flavor to a dish. They are often seen in namul [nah-mool] (vegetable side dishes), marinades, and dipping sauces to enhance existing flavors and to add that Punch of Nuttiness. They are a finishing touch, but the finish is strong. Sesame seeds are available in a variety of colors, which range from light tan to black. Since the seeds can be used in a variety of sweet and savory applications, and have slight differences in flavor, it's best to taste before you sprinkle. Koreans often use the expression, “Kkae ga sot a ji nae" ("Sesame seeds are spilled over") to describe a newly married couple, or a couple who are totally in love with each other. This refers to the harvesting of the sesame plant: When you shake it, the seeds fall of easily, making the process more fun. And we all know love and fun aren't just garnishes. Though soy sauce leads a strange double life in small plastic packets at the bottom of paper bags, it's important to recognize the complex and delicious flavor it adds to food. Ganjang is a soybean-based fermented sauce with a distinct umami flavor. It is a by-product of doenjang (soybean paste), and it contains beneficial bacteria when unpasteurized. Ganjang is widely used to season meat and vegetables, and is a staple in dipping sauces. The famous Korean BBQ marinade is mainly made with soy sauce. It's also found hanging out on your refrigerator door, waiting for its big moment. Traditional Korean soy sauce, known as Joseon Ganjang, is made entirely of naturally fermented soy and brine. 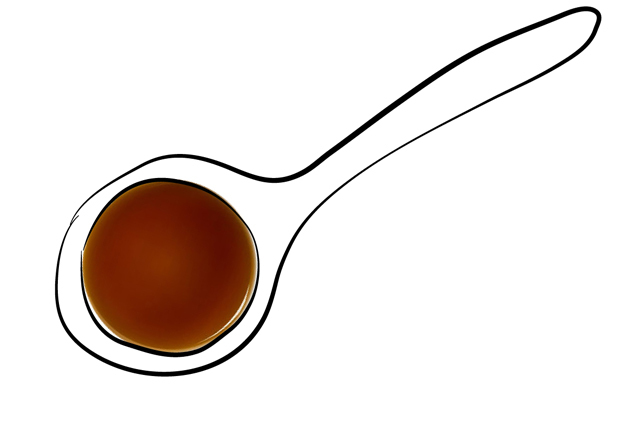 It is often used to season soups, hence the nickname "Guk Ganjang" ("soy sauce for soup"). Koreans today use both Whe-Ganjang (regular soy sauce) and Joseon Ganjang. Traditionally, however, all Korean cooking was done with Joseon Ganjang only. 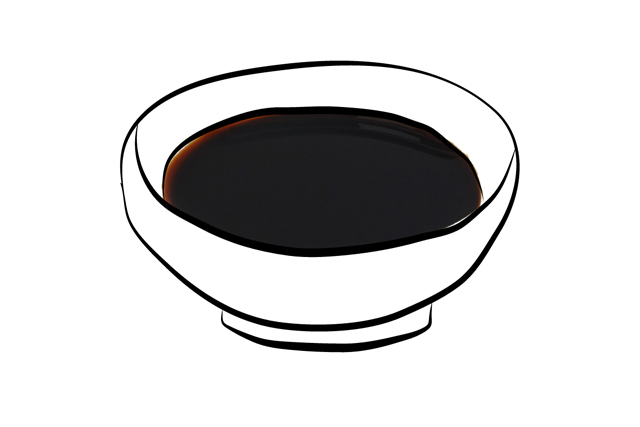 Joseon Ganjang is richer and saltier than common soy sauce, so smaller amounts should be used. But we understand if you can't help yourself. When you think of a pantry staple, you want something that has the aggression of a championship boxer, but the delicacy of a neighborhood florist. It should wake a dish up without overwhelming its other components. Doenajng (soybean paste) is that kind of staple, and it's also the main ingredient for Korea’s most loved stew, doenjang jjigae. Its salty and assertive flavor is great in soups, marinades, and as a seasoning for meat and vegetables. 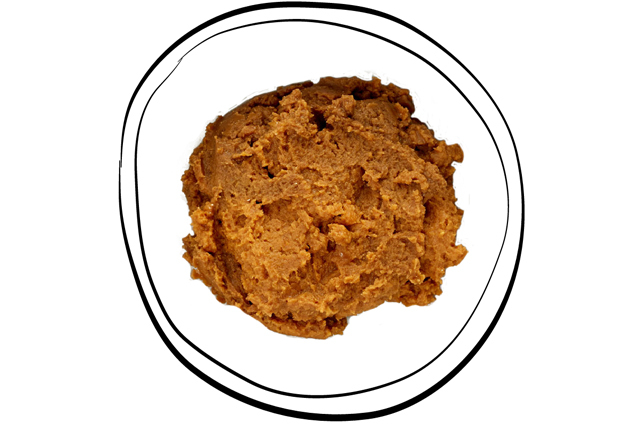 Doenjang is similar to miso (Japanese soybean paste) but has a richer and less sweet taste. For authentic Korean cooking, doenjang should be used. Today, many Koreans buy factory made jang, but foodies in Korea seek out artisanal jang, which embodies traditional flavor and depth—the punch and then the pleasure. Gochujang's spicy/sweet flavor is unlike that of any other hot sauce—accept no substitutions. Fermented from gochugaru (red chili pepper flakes), rice syrups, rice powder, meju (fermented soybeans), and salt, gochujang has a depth and spiciness that adds heat as well as complexity. In Korean cuisine, it is often used to make dishes like Gochujang Jjigae (a spicy stew), Ddukbokgi (a sticky rice cake), and Spicy Korean BBQ. Gochujang has become a hot item in today’s global culinary scene both for its pungency and its versatility. A little goes a long way, but it's the right way. 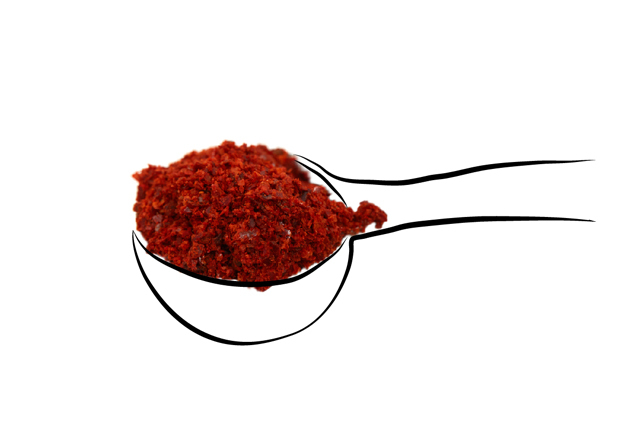 While gochujang is a spicy, sweet, earthy paste, gochugaru is a spicy, smoky, sweet powder. Made from sun-dried chilis, gochugaru adds major backbone to dishes. Koreans often describe gochugaru's flavor as "refreshingly spicy," especially when used in a soup. The spice is used to season many Korean dishes like spicy namul (vegetable side dishes), stir-fried meat and seafoods, and spicy soups. Koreans are very particular about their chilis, and with good reason. Simply put, the freshest, cleanest peppers yield the best gochugaru. As a semi-relevant fun fact, gochugaru apparently repels pests. "Pests" include friends or family members who can't handle spicy food. 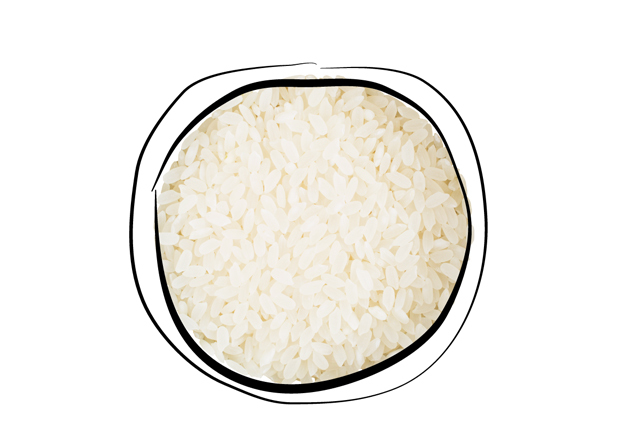 The Korean equivalent to white bread, short grain white rice is ubiquitous in Korean cuisine, although health conscious Koreans prefer multi-grain rice. Most Koreans eat rice three meals a day, except for the occasional substitution of noodles or bread. Koreans do not season the rice because it is typically eaten with banchan (side dishes) which are seasoned. However tempting it might be to douse your rice in soy sauce, it is not the authentic Korean way. It is the late-night, I-don't-care way. Koreans use vinegar to flavor various types of banchan (side dishes) and dipping sauces. The vinegar's acidity perfectly balances the oily, fatty flavor of deep fried or pan fried foods. Koreans often use grain or fruit-based vinegar, the most common of which include brown rice vinegar, plum vinegar, apple vinegar, and lemon vinegar. Since they're very acidic, it is best to use sparingly, but hey, be brave. "Does my months-old box of table salt count?" No. No, it does not. The difference is that naturally dried coarse grain sea salt contains no additives. 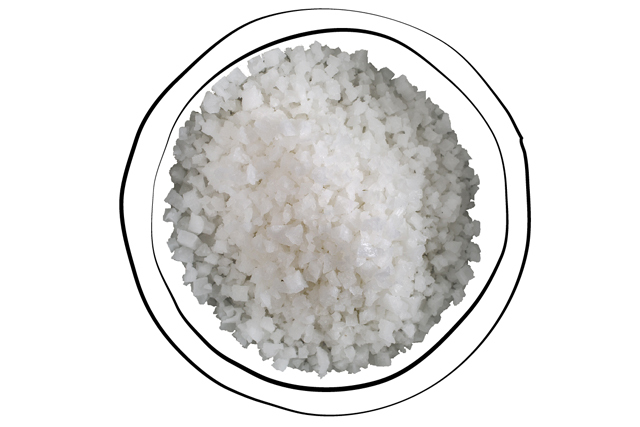 Coarse sea salt is used during fermentation and brining, and to season clear soups, vegetable side dishes, grilled fish, and meat. Korean sea salt is famous for high content of minerals and supreme flavor. So, Koreans prefer Korean-produced sea salt even though it is more expensive. Many essential Korean dishes involve brining, salting, or fermenting, and good sea salt is essential to the process. For example, when making Kimchi, coarse salt is used to salt nappa cabbages because it melts more slowly than the refined salt, so the saltiness is absorbed gradually. Also, the higher content of minerals and water in sea salt speeds up osmosis, allowing a faster and more effective salting/brining process. It creates an optimal texture in kimchi (or the right crispiness). 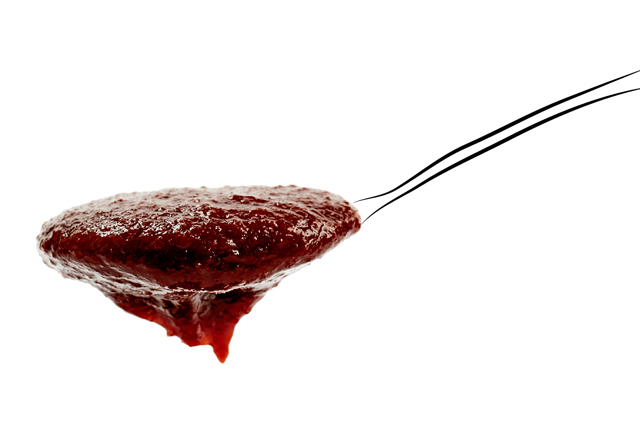 Though not the healthiest ingredient of the bunch (let's be real, it's basically liquid candy), malt syrup is used in Korean cooking to add an appetizing shine to food, or to give it a thick and sticky texture. 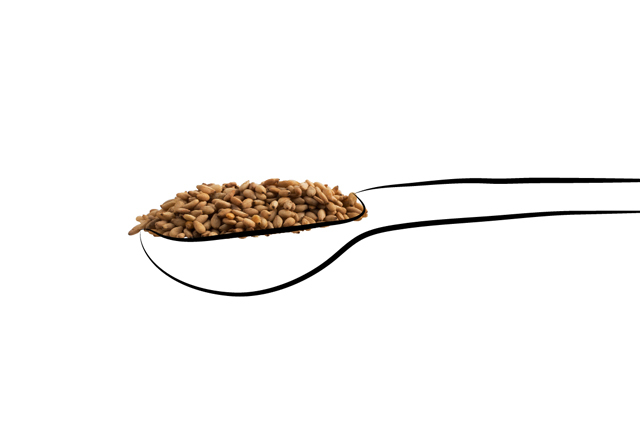 Most common malt syrup in Korea is made with corn, but some use brown rice syrup instead for health reasons. Corn syrup (different from high fructose corn syrup) is actually healthier than refined sugar. Because corn syrup is 100 percent glucose and the human body can metabolize glucose from every cell, it doesn't overload your body. Refined sugar on the other hand, is fructose, which only the liver can metabolize. Please advise me, about Corn Syrup. Is the American Karo Syrup similar to the Malt Syrup you describe? I lived in Seoul from '85 thru '88, and evolved into a person who prefers the spicy-sweet cuisine. (As an aside, I also evolved to prefer petite ladies). I live near Ft Smith Arkansas, which has many Vietnamese and Thai citizens, and a few Chinese in massage parlors. I've met only one Korean woman around here, who ran a very short lived "Asian" restaurant, and almost soiled herself when I asked :"Ajumani, Hanguk saram, imnikka?" ( I probably screwed up the translation spelling, but whatever) and I've heard of another who is a hairdresser, about 30 miles from me. The local "Asian" markets usually can provide me with some Korean culinary items, like sesame oil, chalgo-churang, and Neoguri noodles (currently out of stock, but I know they are Udon noodles, so no problem). They also have the yellow and red versions of Banchan which are made from Daikon radish (I don't know the Korean words for Daikon (White) radish). For my favorite entree, ojinguh-bokkeum, I must rely on the frozen seafood department, which usually has some squid rings or squid crowns. No fresh seafood in the middle of the North American continent. So I get by with Miso, and such. And I've yet to find a Tofu which I can squeeze enough water out of to fry. I cook for myself, since most of my extended family are only willing to try the "Newest" fried chicken recipe, or Goulash, or any combination of cheese and Italian noodles. Don't get me wrong, my "Go-To" meal, when I have no time, is still Ramyun, with eggs, cheese, and any kinda of left-over meat, with some yellow Daikon and Kimchi. But getting back to my question: I use honey, most of the time, and Sesame Oil for shine. I have never heard the term "Malt Syrup", and I have gone with the presumption that "Corn Syrup" is like, the absolute worst of the sweeteners available. But you introduced the term "High Fructose", and implied a differentiation. May I ask you to explain? Hi Kevin, wow i am impressed with your love for Korean food. High fructose corn syrup is more processed than regular corn syrup and had added enzymes. Therefore, it is viewed as worse than regular corn syrup. Honey is of course better than any corn syrup. Many Koreans also use brown rice syrup instead of corn syrup but it does add the brown rice flavor to the dish. Corn syrup does add a good shine and thickness to the dish without adding strong flavors. However, corn syrup is not necessary if you are trying to eat healthy. Hope this helps. Happy cooking! © 2019 Crazy Korean Cooking. Copyright reserved 2019 CK Living LLC. Yes, please sign me up for the Crazy Korean Cooking email newsletter.